A new school website design for Aylesford School near Maidstone in Kent that showcases students character strengths and uses integrated social media to share school news with stakeholders and the local community. Aylesford School in Kent recently introduced a new senior leadership team that embarked upon a journey to boost the schools’ reputation and increase its enrolment. The teams’ vision was to provide a ‘Character Education’ which develops confident young people who are successful learners and contribute positively to society. Working with students, staff and parents they identified ten character strengths which they are building in to day to day life at the school, while a reward system has been formulated to recognise and reward pupils who demonstrate one of the strengths. A new prospectus helped formally introduced the character strengths, while fresh local advertising used positive parental messages to give confidence in the direction the school was taking with the character strengths forming a common baseline. A new school website design was commissioned to replace an older platform. 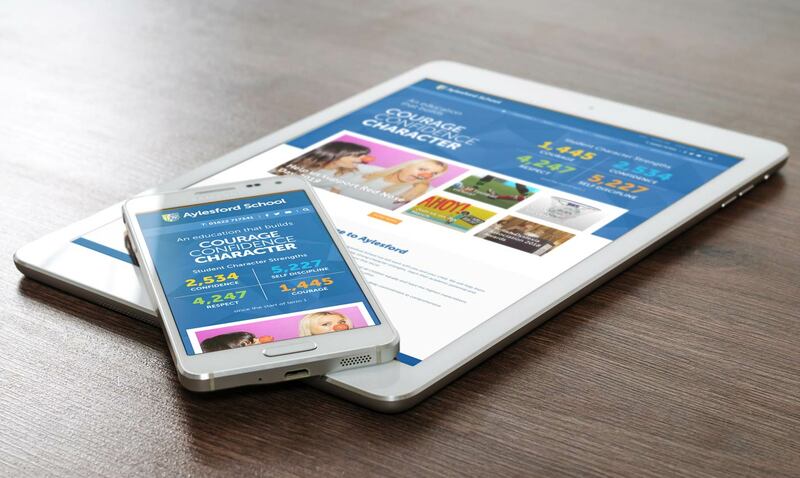 Its brief called for an easy to manage, on-brand, Ofsted ready website that performed well on mobiles as well as desktop computers and of course showcased the schools’ character strengths. Aylesford Schools’ character strengths feature prominently on the website. The site has been developed to proudly display dynamic accumulating student totals for each of the character strengths. Sharing is easy at Aylesford. The site was developed to fully integrate with Facebook, Twitter and leading social media platforms - encouraging quick and easy publishing of daily news and achievements with staff, parents, students and the wider community. The site is ‘Ofsted ready’, but more importantly information is quick and easy to find for both parents and the inspectors should they call. You can visit the Aylesford School website at https://www.aylesford.kent.sch.uk/.